The team knows my love for baseball, and I apologize for the somewhat abstract post, but I felt I had to pay tribute to one of the all time greats. At an early age I got into baseball history and learned about the legendary "Birdman." He has been a hero ever since. Click on the title above to watch a great interview with him done just about 3 weeks ago. What a fantastic attitude. What a team player. What a class act. Fidrych made the Tigers as a non-roster invitee out of the 1976 spring training, not making his major-league debut until April 20, and not making his first start until mid-May. He only made that start because the scheduled starting pitcher had the flu. Fidrych responded by throwing seven no-hit innings, ending the game with a 2-1 victory in which he gave up only two hits. He went on to win 19 games, led the league in ERA (2.34) and complete games (24), was the starting pitcher in that year's All-Star Game, won the American League Rookie of the Year Award, and finished second in voting for the Cy Young Award. 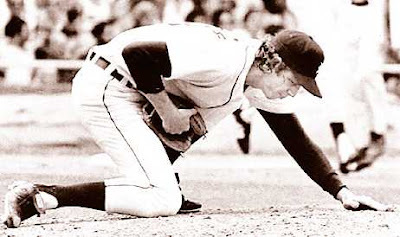 In the process Fidrych also captured the imagination of fans with his antics on the field. He would crouch down on the pitcher's mound and fix cleat marks, what became known as "manicuring the mound", talk to himself, talk to the ball, aim the ball like a dart, strut around the mound after every out, and throw back balls that "had hits in them," insisting they be removed from the game. On June 28, 1976, he pitched against the New York Yankees in a nationally televised game on ABC; the Tigers won the game 5-1. After a game filled with "Bird" antics in which he and his team handily defeated the Yankees, Fidrych became an instant national celebrity. Every time he pitched, Tiger Stadium was jam-packed with adoring fans who became known as "Bird Watchers". In his 18 appearances, attendance equalled almost half of the entire season's 81 home games. Teams started asking Detroit to change its pitching rotation so Fidrych could pitch in their ballparks, and he appeared on the cover of numerous magazines, such as Sports Illustrated (twice, including once with Sesame Street character Big Bird), The Sporting News, and became the first athlete to appear on the cover of Rolling Stone. In one week, Fidrych turned away five people who wanted to be his agent, saying, "Only I know my real value and can negotiate it." Fidrych also drew attention for the simple, bachelor lifestyle he led in spite of his fame, driving a green subcompact car, living in a small Detroit apartment, wondering aloud if he could afford to answer all of his fan mail on his league-minimum $16,500 salary, and telling people that if he hadn't been a pitcher, he'd work pumping gas in Northborough. He fascinated everyone, most especially young girls, with his frizzy blond curls, blue jeans, and devil-may-care manner. "Sometimes I get lazy and let the dishes stack up, but they don't stack too high. I've only got four dishes." "That ball has a hit in it, so I want it to get back in the ball bag and goof around with the other balls in there. Maybe it'll learn some sense and come out as a pop-up next time."